Buy "X-parameters" and Bring an End to the Confusion! Cambridge University Press recently published "X-Parameters"*, authored by David Root, Jan Verspecht, Jason Horn and Mihai Marcu. This book brings an end to more than a decade of confusion and misunderstandings concerning this technology. In the past information was scattered amongst many different scientific papers that were published across a timespan of 17 years! Ever changing naming conventions and mathematical notations made it hard to learn, understand and use the technology. This book presents a complete, actual and coherent publication on the subject, a must read for RF & microwave engineers! SWAP-X402's demonstrated by VTD and Mesuro at the 2011 European Microwave Week in Manchester! Our spin-off company Verspecht-Teyssier-DeGroote (VTD) presented state-of-the-art pulsed time domain load pull measurements with the SWAP-X402. The SWAP-X402 is the world’s fastest NVNA receiver, performing real time measurements at a rate of 10 dynamic load lines per second, even in pulsed mode! The company Mesuro demonstrated their loadpull setup using a second SWAP-X402. Read all about VTD and Mesuro's latest SWAP-X402 application in the EuMW edition of Microwave Journal. SWAP-X402, World's Fastest NVNA, successfully demonstrated at the IMS 2011 in Baltimore! Jan Verspecht was present at the International Microwave Symposium in Baltimore. Our spin-off company Verspecht-Teyssier-DeGroote (VTD) succesfully demonstrated the SWAP-X402, world's fastest and most affordable NVNA. The exhibition offered a great opportunity to meet existing as well as future customers as VTD's booth got a lot of interested visitors. But excitement was not limited to the conference center. On the left you see the baseball Jan Verspecht caught during the Monday ballgame, right off the bat of Derrek Lee! Baltimore, definitely our favorite IMS conference location! Jan Verspecht presented the latest results on Dynamic X-parameters* at the Memory workshop of the 76th ARFTG Microwave Measurement Conference (December 3rd 2010, Clearwater Beach, FL, USA). The slides of all workshop presentations are available on line (courtesy of ARFTG). As shown in the presentation dynamic X-parameters can accurately describe long term memory effects like IM3 sweet spots, hysteresis in AM-AM and AM-PM, asymmetric spectral regrowth,... Dynamic X-parameters* can accurately model nonlinear amplifier behavior under narrowband as well as wideband modulated excitation. We are proud to announce that the attendees of the Spring 2010 ARFTG Conference have choosen our contribution as the Best Oral Presentation (there was a tie with a paper by Yves Rolain et al. of the Vrije Universiteit Brussels). Our award winning presentation is entitled "A Simplified Extension of X-parameters* to Describe Memory Effects for Wideband Modulated Signals". Co-authors are Jason Horn and David Root of Agilent Technologies. We are honored by winning this award and we hereby thank all attendees who gave a positive evaluation as well as the management of Agilent Technologies and the PANAMA consortium for their continued support. Jan Verspecht was present at the 2010 International Microwave Symposium in Anaheim. He presented the latest results on X-parameters* and memory effects at the ARFTG conference. The paper is entitled "A Simplified Extension of X-parameters* to Describe Memory Effects for Wideband Modulated Signals". Co-authors are Jason Horn and David Root of Agilent Technologies. The new technique deals with X-parameters* with memory in the case of wideband modulation with stationary statistics. Jan Verspecht was also present at the exhibition booth of the company Verspecht-Teyssier-DeGroote (VTD). VTD demonstrated the fastest and most affordable receiver for time domain loadpull applications: the SWAP-X402. X-parameters* and other technology pioneered by Jan Verspecht are featured on the cover of the March 2010 issue of Microwave Journal. The cover feature article, authored by Microwave Journal editor David Vye, reveals the history of modern nonlinear microwave measurement techniques and gives an excellent overview of the many commercial solutions and enterprises that are in existence today. As a seasoned entrepeneur and a recognized pioneer in this high-tech field, Jan Verspecht considers it an honor to have helped the author by providing information on this highly complex subject. A must read for all microwave engineers! Out of 114 presentations, our contribution "Extension of X-parameters* to Include Long-Term Dynamic Memory Effects", presented at the 2009 International Microwave Symposium, has been selected by the attendees as the Best Oral Paper Presentation of the Day, for Wednesday, 10 June 2009. Co-authors are Jason Horn, Loren Betts, Chad Gillease and David Root of Agilent Technologies, Roger Pollard of the University of Leeds and Daniel Gunyan. We are honored by winning this award and we hereby thank all attendees who gave a positive evaluation as well as the management of Agilent Technologies and the PANAMA consortium for their continued support. A powerful new method was developed to include memory effects with X-parameters*. The measurements are based on accurately measuring large signal step responses and were performed using Agilent PNA-X hardware and dedicated software. Early results of this on going R&D work sponsored by Agilent Technologies were presented at the IMS 2009: "Extension of X-parameters* to Include Long-Term Dynamic Memory Effects". Co-authors are Jason Horn, Loren Betts, Daniel Gunyan, Chad Gillease and David Root of Agilent Technologies and Roger Pollard of the University of Leeds. The first SWAP-X402's have been delivered to the early adaptors of this revolutionary technology (SWAP-X402 product brief). The SWAP-X402 is a product of Verspecht-Teyssier-DeGroote SAS, a spin-off from Jan Verspecht BVBA and the XLIM research institute. The instrument provides a simple and affordable way to add time domain loadpull capability to virtually any loadpull setup. A 20GHz SWAP-X402 is available for 80.000 euros. Jan Verspecht was present at the International Microwave Symposium 2009 in Boston (June 7-12). He presented the paper "Extension of X-parameters* to Include Long-Term Dynamic Memory Effects". Co-authors are Jason Horn, Loren Betts, Daniel Gunyan, Chad Gillease and David Root of Agilent Technologies and Roger Pollard of the University of Leeds. Jan also co-authored the paper "Bursts of Pulses for Time Domain Large Signal Measurements". This paper was presented during the ARFTG conference by Jad Faraj of XLIM. First author is Jad Faraj, other co-authors are Raymond Quéré and Jean-Pierre Teyssier of XLIM and Fabien De Groote of Verspecht-Teyssier-DeGroote s.a.s. We are proud to announce that the editors of Electronic Products have chosen the X-parameters* as a winner of the Product of the Year 2008 Award (link to Electronic Products). Dr. Jan Verspecht is the inventor of the X-parameters*, a product of Agilent Technologies that resulted from a highly successful collaboration with Jan Verspecht b.v.b.a.. The European Microwave Week 2008 took place in Amsterdam, the beautiful city of canals, also famous for its thriving coffee, mushroom and bikini business. On Monday October 27th Jan presented the paper "X-parameter Measurement and Simulation of a GSM Handset Amplifier" (other authors are Jason Horn, Daniel Guyan, Loren Betts and David Root from Agilent Technologies and Joakim Eriksson from Sony-Ericsson Mobile Communications) This presentation was part of the EuMIC 2008. Jan also co-authored the paper "Pulse Profiling for AlGaN/GaN HEMTs Large Signal Characterizations". This paper was presented by rookie Jad Faraj of XLIM during the special NVNA Users' Forum Session on Thursday. Co-authors of this paper are Fabien De Groote and Jean-Pierre Teyssier from Verspecht-Teyssier-DeGroote s.a.s., Raymond Quéré from XLIM and R. Aubry from Alcatel-Thales III- Lab. Get a better understanding of X-parameters* by discovering their genesis. The very first paper on the concept is entitled "Black Box Modelling of Power Transistors in the Frequency Domain" (download pdf). The paper was authored by Jan Verspecht, at that time working as a research engineer for HP, and was presented during the 4th International Workshop on Integrated Nonlinear Microwave and Millimeterwave Circuits in October 1996 (Duisburg, Germany). This milestone paper introduced the concept of a measurement setup based on tickler tones and a "nonlinear network analyzer" (now called the NVNA option for the PNA-X of Agilent Technologies), the linearization coefficients of the multi-harmonic spectral mapping operators (now called the X-parameters*) and the link with harmonic balance simulators (now available in Agilent ADS). Note that many other interesting vintage papers by Jan Verspecht can be downloaded from this web-site. Jan Verspecht attended the International Microwave Symposium 2008 in Atlanta (June 17-20). He presented "Poly-Harmonic Distortion Measurements: A Maturing Amplifier Measurement Technology" during the full day workshop "Measurements for Wireless System-Level Evaluation" (WSH) on Sunday. Jan also co-authored the paper "High-Power On-Wafer Capabilities of a Time Domain Load-pull Setup" (download pdf). The paper was presented by Fabien De Groote during the ARFTG Interactive Forum. Co-authors are F. De Groote (Verspecht-Teyssier-DeGroote s.a.s. ), J-P Teyssier and J. Faraj (Xlim). Get introduced to Power Transistor Characterization! Our paper entitled "Introduction to Measurements for Power Transistor Characterization" (download pdf) was published in the June 2008 issue of the IEEE Microwave Magazine. Authors are Fabien De Groote (Verspecht-Teyssier-DeGroote s.a.s. ), Jean-Pierre Teyssier (XLIM), Tony Gasseling (Amcad Engineering), Olivier Jardel (XLIM) and Jan Verspecht. The paper introduces the concepts of pulsed IV measurements, pulsed S-parameter measurements and time domain loadpull techniques. On May 7th 2008 Jan Verspecht presented the paper "Advanced Time Domain Loadpull Technique for Characterization of Microwave Power Transistors" (download pdf) at the ESA Microwave Technology and Techniques Workshop 2008 (Noordwijk, The Netherlands). Co-authors are Fabien De Groote (Verspecht-Teyssier-DeGroote s.a.s., Brive, France) and Jean-Pierre Teyssier (Xlim, Brive, France). In 2007 the Board of Directors of the IEEE awarded the prestigious grade of IEEE Fellow to 16 members of the MTT. They were recognized in Honolulu during the well attended plenary session of the IMS 2007. On the picture we recognize 3 new Fellows: Jose Carlos Pedro of the Universidad de Aveiro, (Aveiro, Portugal), John Wood of Freescale (Tempe, Arizona, USA) and Jan Verspecht (Opwijk, Belgium), all of them experts in the field of nonlinear microwave measurements and modelling. At Jan Verspecht b.v.b.a. we want to congratulate the new Fellows. We also want to express our gratitude to all of the people who supported Jan Verspecht during his challenging career as an independent consultant and as such contributed to his IEEE Fellowship. Jan Verspecht was in Hawai`i for the International Microwave Symposium 2007. He presented the paper "Multitone, Multiport, and Dynamic Memory Enhancements to PHD Nonlinear Behavioral Models from Large-Signal Measurements and Simulations" (download pdf). This paper is co-authored by Daniel Gunyan, Jason Horn, Jianjun Xu, Alex Cognata and David Root of Agilent Technologies. Jan co-authored the paper "On-Wafer Time Domain Load-Pull Optimization of Transistor Load Cycle with the New Multi-Harmonic MPT Tuner" (download pdf), presented as a poster paper at the ARFTG Conference on Friday June 8th. Other authors are Fabien De Groote, Olivier Jardel, Jean-Pierre Teyssier of XLIM (France), Tony Gasseling of AMCAD Engineering (France), Vince Mallette and Christos Tsironis of Focus Microwaves (Canada). Jan Verspecht presented two papers at the Power Amplifier Symposium in Long Beach, CA, from Sunday January 7th until Tuesday January 9th. On Sunday Jan presented a talk on "Affordable Large-Signal Network Analyzer Technology" during the workshop "WS2: RF Power Transistors and Amplifier Characterization Techniques", organized by John Wood and Basim Noori (Freescale, Tempe, USA). During the plenary session on Monday morning Jan presented an invited paper entitled "Advanced Measurements for Power Transistors" (download pdf). Both presentations are co-authored by Jean-Pierre Teyssier and Fabien De Groote (XLIM, France) and introduce our affordable LSNA technology. During the last week of November 2006 Jan Verspecht attended the 68th ARFTG conference in Broomfield (Colorado, USA). He co-authored a paper entitled "Load-pull measurement of transistor negative input impedance" (download pdf). The first author of the paper is Fabien De Groote, other co-authors are Jean-Pierre Teyssier and Raymond Quere of XLIM (formerly IRCOM, France). Friday afternoon all members of ARFTG were invited for a fascinating visit to the laboratories of the National Institute of Standards and Technologies (NIST) in Boulder. During the visit we had the honor of seeing the world's one and only traceable harmonic phase standard. This setup was built by Dr. Dylan Williams and is based on a photo-electric sampler. A special thanks from Jan Verspecht goes to Dylan Williams and Kate Remley for hosting me in their wonderful historical house, known as the Arnett-Fullen house (see picture). Our PHD Model Made the Cover of the June 2006 Issue of the IEEE Microwave Magazine! We proudly announce the publication of our paper on Polyharmonic Distortion Modeling as the features article in the June 2006 issue of the IEEE Microwave Magazine (download pdf). The article is authored by Jan Verspecht and David Root. The paper introduces you to the Polyharmonic Distortion Modeling technique. This so-called PHD modeling technique is a powerful black-box frequency domain behavioral modeling technique, based on the theory of the scattering functions. It is explained in the paper how nonlinear behavior may cause unhappiness. This fact is illustrated by (:-) faces that get squeezed (:-( by the conjugate a21-terms, which are only present in the case of nonlinear behavior. Jan Verspecht was in San Francisco for the International Microwave Symposium 2006. Jan co-authored two presentations. The first was entitled "Nonlinear Behavioural Models with Memory: Formulation, Identification and Implementation". Authors are David Root (Agilent Technologies), Jan Verspecht and David Sharrit. It was presented in the workshop "WSL: Memory Effects in Power Amplifiers". The second paper was entitled "Accurate Phase Measurements of Broadband Multitone Signals using a Specific Configuration of a Large Signal Network Analyzer". Authors are M. El Yaagoubi, G. Neveux, D. Barataud, J. Nebus (University of Limoges XLIM) and Jan Verspecht (download pdf). We thank rookies Hind Bousbia of Xlim and Floria Blanchet of STMicroelectronics for providing the undistorted (:-) faces on the picture. Don't miss the December 2005 issue of the IEEE Microwave Magazine! We proudly announce the publication of our paper on Large-Signal Network Analysis as a features article in the December 2005 issue of the IEEE Microwave Magazine (download pdf). The paper introduces you to the world of Large-Signal Network Analysis (LSNA) and invites you to join the rapidly growing LSNA community. The 66th ARFTG conference: definitively a three-pointer! December 1st and 2nd Jan Verspecht attended the 66th ARFTG conference in Washington DC. There were many interesting presentations on a wide variety of topics, from nanotubes to 500 GHz network analyzers. Mohamed Sayed, technical program chair, and Greg Burns, general chair, did a great job and definitely scored a three-pointer. Jan Verspecht presented the paper "Hot S-Parameter Techniques: 6=4+2" (download pdf). Read the paper and find out what is missing with the Hot S-parameter techniques of Agilent, Anritsu and Rohde & Schwarz. Fabien De Groote of IRCOM did an excellent job in presenting the paper "Time Domain Harmonic Load-Pull of an AlGaN/GaN HEMT" (download pdf). Co-authors are Olivier Jardel, Denis Barataud, Jean-Pierre Teyssier and Raymond Quere of IRCOM and Jan Verspecht. Friday evening was NBA time: the picture on the left shows a Milwaukee Buck taking a shot at the Washington Wizards basket. A new extensive paper on the Poly-Harmonic Distortion (PHD) black-box frequency domain modelling technique has been published in the November 2005 issue of the IEEE Transactions on Microwave Theory and Techniques (download pdf). Authors are David Root, David Sharrit and Alex Cognata of Agilent Technologies, John Wood of Freescale and Jan Verspecht. The paper is entitled "Broad-Band Poly-Harmonic Distortion (PHD) Behavioral Models From Fast Automated Simulations and Large-Signal Vectorial Network Measurements". Next to the theory of the PHD model, it is explained how the PHD model can be extracted based on nonlinear vector network analyzer (NVNA) measurements or harmonic balance simulations using Agilent ADS. On the left David Root and Jan Verspecht prepare for presenting their joint paper "Broad-Band, Multi-Harmonic Frequency Domain Behavioral Models from Automated Large-Signal Vectorial Network Measurements" (download pdf). The paper was presented at the MTT-S poster session on Thursday June 16th. Other authors are Alex Cognata of Agilent Technologies and John Wood, now with Freescale. During the poster session a small earth quake took place, a vibrant experience. A second IMS paper was also co-authored by Jan Verspecht. The title is "An improved coupling method for time domain load-pull measurements". The work was brilliantly presented by rookie Fabien De Groote at the ARFTG conference on Friday June 17th (download pdf). Other authors are Jean-Pierre Teyssier of IRCOM (France) and Christos Tsironis of Focus Microwaves (Canada). Picture courtesy of Daniel Gunyan, Agilent Technologies. Artech House recently published the book "Fundamentals of Nonlinear Behavioral Modeling for RF and Microwave Design" (link to Artech House). The book was edited by Dr. John Wood and Dr. David Root. The book is a revised collection of groundbreaking presentations that were made at a successful workshop during the 2003 International Microwave Symposium. The book gives an excellent overview of existing methods and is a great starting point on any large-signal microwave modelling journey. It is authored by no less then 10 renowned experts in the field of nonlinear behavioral modeling for RF and microwave: Nuno Borges Carvalho, Edouard Ngoya, Jose Carlos Pedro, David E. Root, Arnaud Soury, Nick Tufillaro, Jan Verspecht, John Wood, Jianjun Xu and Qi-jun Zhang. Fresh of the Press: Circles of the Olympic Games Logo Start Rolling! Fortunately for the athletes the press has it wrong: the coloured rings on the left have nothing to do with the next Olympics. The meaning of the rotating coloured rings is explained in detail in a new paper entitled "Linearization of Large-Signal Scattering Functions" (download pdf). The paper is the result of a fruitful collaboration between the National Institute of Standards and Technology (NIST), the Catholic University of Leuven (Belgium) and "Jan Verspecht bvba". The paper has been published in the April 2005 issue of the IEEE Transactions on Microwave Theory and Techniques. Authors are Jan Verspecht, Dylan F. Williams (NIST), Dominique Schreurs (Catholic University of Leuven), Kate A. Remley (NIST) and Michael D. McKinley (NIST). Jan Verspecht presented the tutorial "Large-Signal Network Analysis - 'Going beyond S-parameters'" (download pdf) during the 64th ARFTG Conference on "Digital Communication System Metrics". The conference took place from November 30 to December 3, 2004 in Orlando, Florida, USA. The tutorial was presented on Wednessday December 1st as part of the ARFTG Short Course program. More information on ARFTG is available on the ARFTG web-site (www.arftg.org). During one of his business trips Jan Verspecht visits the famous garage where Bill Hewlett and Dave Packard started their business in the late 30's. Considered as the "birthplace of Silicon valley" the garage is recognized as a monument by the State of California. A truly inspiring moment! The International Microwave Symposium 2004 took place from June 6th until June 11th in Fort Worth, Texas. This offered a unique opportunity to meet with all kinds of cowboys. At the left Jan Verspecht meets with French cowboy Jean-Pierre Teyssier, just before the NVNA user forum. At the right he meets with an American cowboy at the rodeo arena. Despite their quite different looks, it was discovered that both cowboys have a lot in common. Both wear the same kind of hat and both of them are used to deal with highly nonlinear problems (power transistors for the French cowboy and raging bulls for the American cowboy) (:-). WME workshop at IMS 2004 was a hit! On June 7th 2004 Mr. Ruediger Follman of IMST and Jan Verspecht co-organized the fullday workshop "More efficient Circuit Design by Means of Large-Signal Models and Large-Signal Measurements". This workshop was part of the International Microwave Symposium 2004 in Fort Worth, Texas. The workshop was a real succes having about 80 attendees. As an unfortunate consequence we run out of workshop notes. I apologize to all the people who did not get their notes. A pdf-file of the workshop notes extended with additional and very informative comments for most of the speakers can be downloaded by clicking the button below. Multidimensional interpolation and curve fitting based on scattered input data is now possible in Mathematica thanks to the JanVerspechtMultiDim Mathematica package. This package implements multidimensional interpolation and curve fitting functions which can handle scattered input data. Adding this package to your copy of Mathematica you are no longer constrained to "regular grid" input data, as it is the case with the standard Mathematica Interpolation function. You can download your fully functional free trial version on our products page. It was a great 62nd ARFTG Conference! We attended the ARFTG Microwave Measurement Conference. 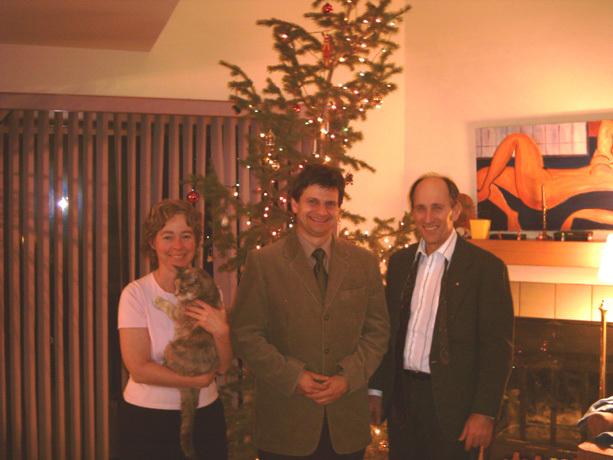 The conference and the associated tutorial sessions took place from Tuesday December 2 until Friday December 5 2003 in Boulder, Colorado, USA. Jan presented the tutorial "Large-Signal Network Analysis - 'Going beyond S-parameters'" (download pdf) during the ARFTG Short Course session on Wednessday December 3. Jan also made a presentation entitled 'The Return of the Sampling Frequency Convertor' (download pdf). This 62nd edition of the ARFTG was definitely one of the best editions in many years. Many topics were covered in high quality presentations. A special thanks from Jan Verspecht goes to his hosts Chair Dylan Williams and Technical Program Chair Kate Remley (see picture) for organizing a truly commemorable event! Picture courtesy of Dr. Marc Vanden Bossche, NMDG Engineering, Belgium. 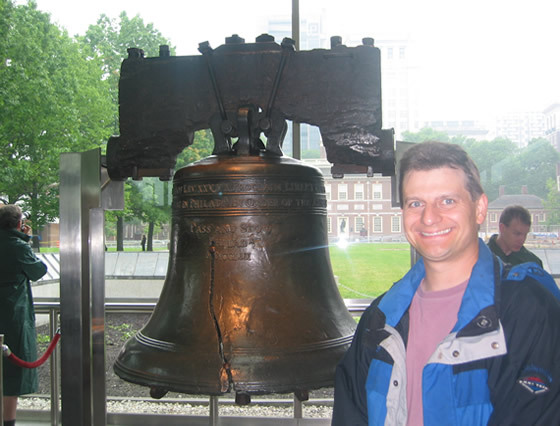 Jan Verspecht attended the International Microwave Symposium (IMS) 2003 in Philadelphia. He made a presentation entitled "Scattering Functions for Nonlinear Behavioral Modeling in the Frequency Domain" (click for pdf) in the workshop "Fundamentals of Nonlinear Behavioral Modeling: Foundations and Applications", organised by Dr. David Root and Dr. John Wood of Agilent Technologies. The symposium visit was a big hit. We were able to meet many old friends and colleagues and made many new acquintances. Too bad the Phillies baseball game on Saturday was cancelled because of the rain! But we did get a chance to see the Liberty bell. I really like the picture below: the symbol of Liberty together with Jan Verspecht, who in his own way proclaimed liberty by founding "Jan Verspecht bvba". Great! Picture courtesy of Dr. Dominique Schreurs, Catholic University of Leuven, Belgium. "Jan Verspecht bvba" is up and running. We move fast forward with confidence. The mission is simple: to assist the many people who are developing the RF and microwave tools of the future. For Jan Verspecht it is like continuing his old job in a new company. We are looking forward to keep on interacting and cooperating with the many great people we have met in the past. And of course we are eagerly looking forward to make new acquintances. Working together we can take RF and microwave instrumentation beyond S-parameters! We have created a search engine to assist you in finding publications that may be relevant to your application. The search covers all publications authored or co-authored by Jan Verspecht. The search engine is available through our database for registered users. Please login by entering the password. * X-parameters is a registered trademark of Agilent Technologies, Inc. This site is neither endorsed, nor sponsored by Agilent Technologies, Inc.